This Christmas I actually finished all my gift makes in reasonable time (the first miracle) and was relaxed enough to sneak in some sewing for fun (the second miracle). 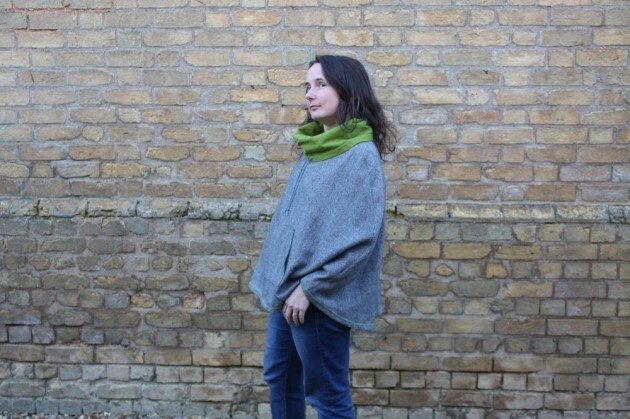 I opted for the new April Rhodes pattern, The Popover Poncho. It was the perfect choice. Such a quick and simple pattern, a really joy to sew. I had seen a number of these made up around the web and it looked like a winner. 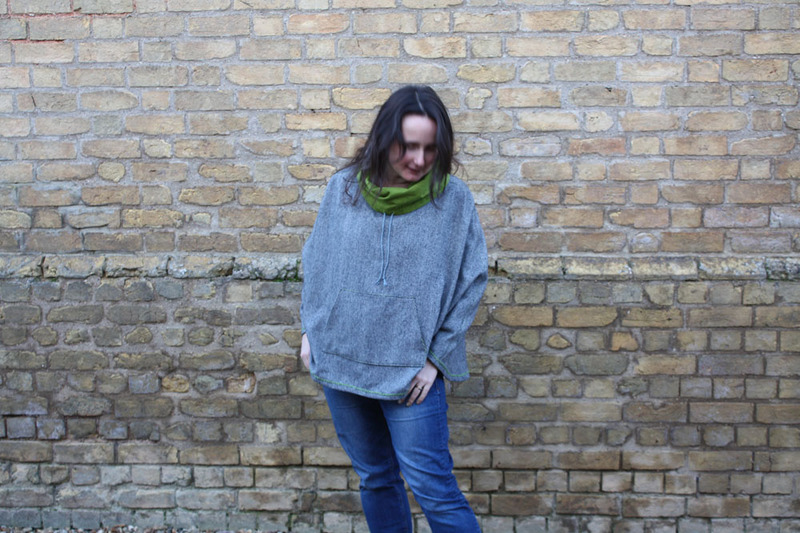 I made up the M/L size in a Wool Blend Tweed Coating from the shop (currently 15% off in the sale, in fact, all our coatings have just gone in the sale with discounts of up to 20%.) This coating drapes really nicely and washed really well. The contrast is one of the Studio E Peppered Shot Cottons: Green Tea, a beautiful rich golden green. These Peppered Cottons are so lovely for dressmaking, really soft against the skin, so perfect for the cowl neck. I didn't make many changes. 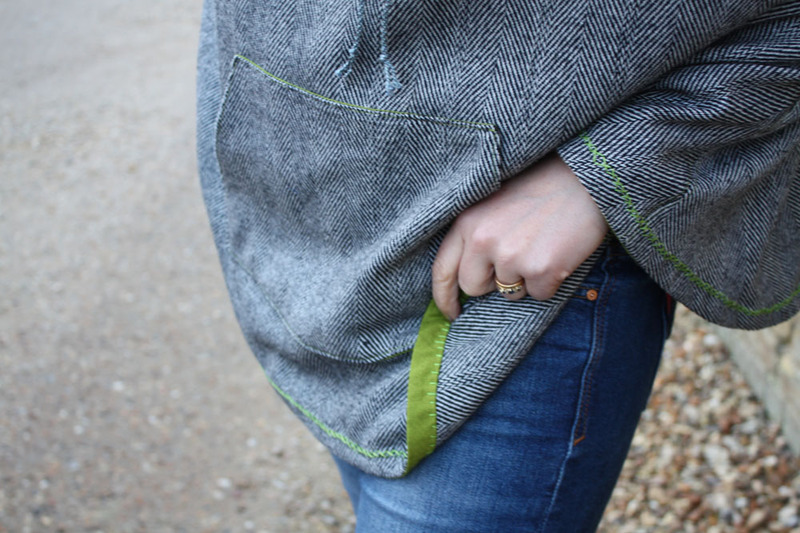 I lined my kangaroo pocket with the contrast fabric, which seemed like a no brainer, and then I faced the hem with the bias strips of green rather than binding like in the instructions. I also added a rough cross stitch to finish the facing and add detail to the hem. 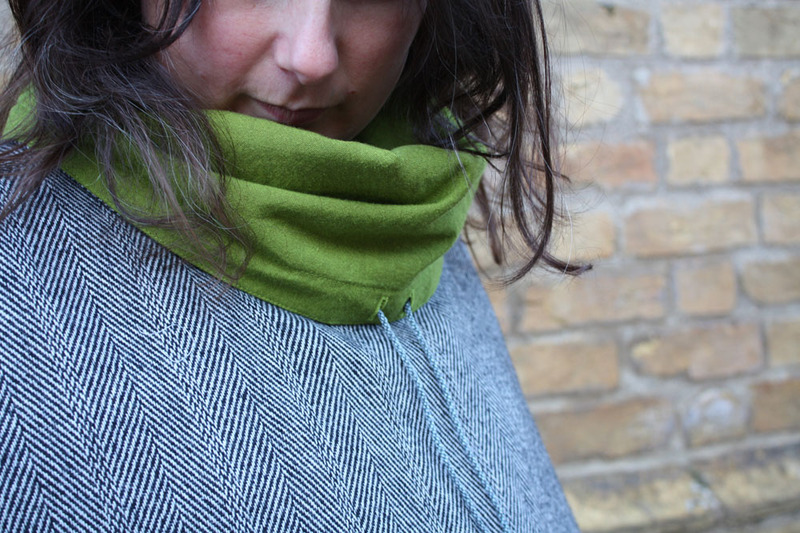 I am trying to think more about how I can customise the garments that I make, and I love to hand stitch (in front of the TV) so combining the two was a happy mix. There is a small tale to tell about that cross stitch though. I stitched with stranded floss, splitting the floss into three strands for a finer finish. I got out the DMC colour chart to pick the best green from the gazillion different colours and picked out my best match, 704. When I started stitching I realised that actually a twisted perle thread would have been better as I was getting some strands splitting and it wasn't looking quite as neat as it could. Then... it occurred to me that of all the colours I picked, 704 was the exactly the same green as we stock in the perle in the shop... doh! Well, I wasn't about to unpick it, it's not that bad! Love that fabric and with the green it just looks perfect!